Monte Carlo Solitaire is a simple card game that depends heavily on luck, although skilled players will win more often than beginners. It is also known as Double and Quits, Good Neighbors, or Weddings. Players: This is a solitaire game to be played by one player. Deck: Monte Carlo is played with one standard 52-card deck that has been thoroughly shuffled. Goal: The goal of Monte Carlo Solitaire is to remove all of the cards from the table in matching pairs. The game playing time is quick, it takes just a few minutes to get through a game. It is a fairly easy game as cards are simply being matched for value, with no matching of suits or adding of values. It's suitable for children who can spot matches and are able to move the cards in the proper consolidation sequence. While there is some strategy in leaving pairs unmatched if it means a better rotation of cards in the next consolidation, the game is mostly chance. There is a low chance of winning, only about one in every 20 games. Deal 25 cards onto the table, forming a 5x5 grid. 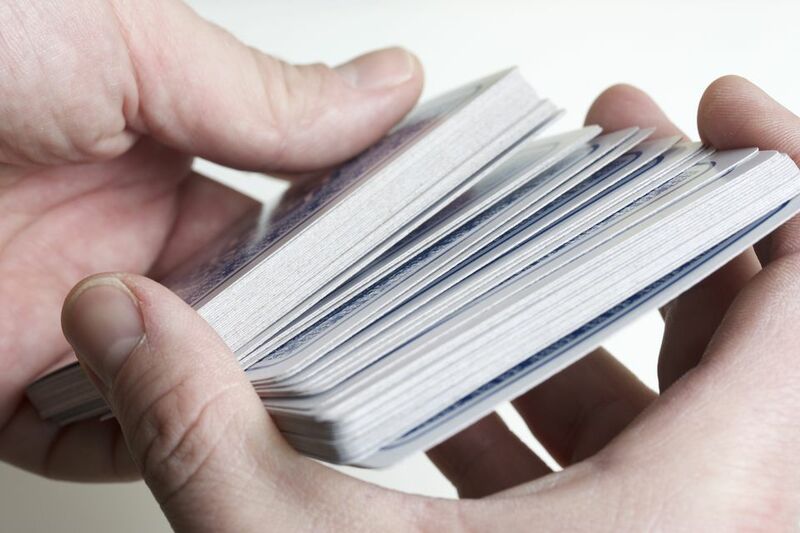 Set the remaining cards to the side, forming a face-down draw pile. Matching pairs (e.g. two 4s, two Js, etc.) can be removed from the table when they are next to each other horizontally, vertically, or diagonally. Any cards removed in this way are discarded. Once a player removes all of the pairs that she wants to (there are times when it makes strategic sense not to remove a pair), the board is consolidated. Consolidation involves filling in the gaps by moving cards to the left, and up a row if necessary. The empty spaces on the board are then filled in with cards from the draw pile. When the draw pile is empty, consolidation still takes place but without this final step. The game continues until either all cards have been discarded, or no further legal moves are possible. The only real opportunity for strategy is to note where cards will be rotated to the left and up during consolidation. If you can create more pairs by not removing a matched pair, then a good strategy would be to leave it until after the consolidation. This requires more study of the tableaux before making moves. A player wins by matching and discarding all 52 cards. There is a low chance of winning, so you should celebrate your luck and skill each time that happens. Monte Carlo Thirteens is a closely related solitaire card game. In this variation, kings, and pairs of cards whose values total 13 are removed from the tableaux until all cards have been removed or there are no further possible moves. How Do You Play Accordian Solitaire?